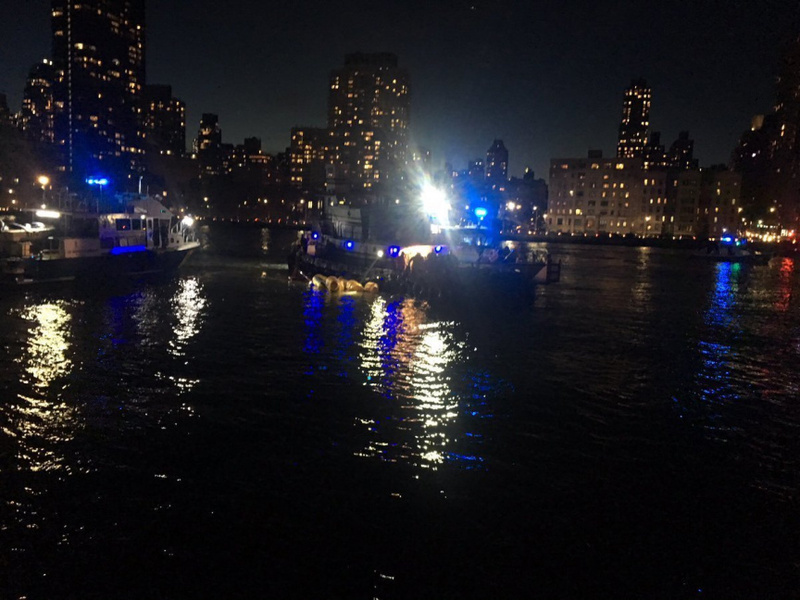 NEW YORK (AP) — A helicopter crashed into New York City's East River Sunday night and flipped upside down in the water, killing two of the six people aboard and leaving three others in critical condition, officials said. Video taken by a bystander and posted on Twitter shows the red helicopter land hard in the water and then capsize, its rotors slapping at the water. The helicopter, a private charter hired for a photo shoot, went down near Gracie Mansion, the mayoral residence. One person, the pilot, freed himself and was rescued by a tugboat, officials said. The passengers were recovered by police and fire department divers, who had to remove them from tight harnesses while they were upside down, Fire Commissioner Daniel Nigro said. "It took awhile for the drivers to get these people out. They worked very quickly as fast as they could," Nigro said. "It was a great tragedy that we had here." Witnesses on a waterfront esplanade near where the aircraft went down said the helicopter was flying noisily, then suddenly dropped into the water and quickly submerged. But the pilot appeared on the surface, holding onto a flotation device as a tugboat and then police boats approached. "It's cold water. It was sinking really fast," Mary Lee, 66, told the New York Post. "By the time we got out here, we couldn't see it. It was underwater." Celia Skyvaril, 23, told the Daily News that she could see a person on what looked like a yellow raft or float screaming and yelling for help. News footage showed one victim being loaded into an ambulance while emergency workers gave him chest compressions. A bystander, Susan Larkin, told The Associated Press that she went down to see rescue boats in the river and a police helicopter circling overhead, hovering low over the water. "You could clearly see they were searching," she said. A Federal Aviation Administration spokeswoman said the Eurocopter AS350 went down just after 7 p.m. The aircraft was owned by Liberty Helicopters, a company that offers both private charters and sightseeing tours popular with tourists. A phone message left with the company was not immediately returned. The skies over New York constantly buzz with helicopters carrying tourists, businesspeople, traffic reporters, medical teams and others. Crashes are not unheard of. In 2009, a sightseeing helicopter of the same model and operated by the same company as the one in Sunday's wreck collided with a small, private plane over the Hudson River, killing nine people, including a group of Italian tourists. A crash in October 2011 in the East River killed a British woman visiting the city for her 40th birthday. Three other passengers were injured. A helicopter on a sightseeing tour of Manhattan crashed into the Hudson River in July 2007, shaking up the eight people aboard but injuring no one. In June 2005, two helicopters crashed into the East River in the same week. One injured eight people including some banking executives. The other hit the water shortly after takeoff on a sightseeing flight, injuring six tourists and the pilot. Nigro and Police Commissioner James O'Neill said the rescue operation Sunday took place in a 4 mph current in water about 50 feet (15 meters) deep, under challenging conditions. The cause of the crash is unknown. The FAA and the National Transportation Safety Board are investigating. Officials did not immediately release the names of the pilot or passengers or say how the two passengers died. The helicopter was recovered in the rescue operation and towed to a pier.